Wow, fifty days since I set my mind to dropping weight. Unfortunately it hasn’t gone as planned, and although I’ve lost a little bit, it’s nowhere near where I thought I’d be right now. A lot of that is just me losing focus, though like I’ve talked about over the past week, I’m starting to regroup and get back on track. Today was the start of my weekend this week, as I had to work yesterday. I had a lot of plans, but in typical first-day-of-the-weekend fashion, I spent a majority of the day napping. I skipped breakfast (I know, that’s not a good start, I have no excuse other than time got away from me and I couldn’t find the effort to make anything). I headed off to my local nail salon to get my nails redone. They usually last me between 3-4 weeks if I stretch it, but counting back, this particular refill only lasted two. The main problem that I have is on one particular finger, whenever it gets slightly too long, the nail catches on absolutely everything. I don’t know what it is about that finger, but it’s basically like gauge of when I need to get back to the salon, and the finger was hurting like crazy so off I went. I have a wedding next weekend so I knew I had to pick something that would go with the dress I bought. Plus, I’m always trying to avoid typical pink/red colours. I figure if I’m paying for someone to do them, I don’t want them to look like I could have done them at home. I know that even if they were pink, they’d still look professional, but it’s just a thing I have. I can’t explain it. 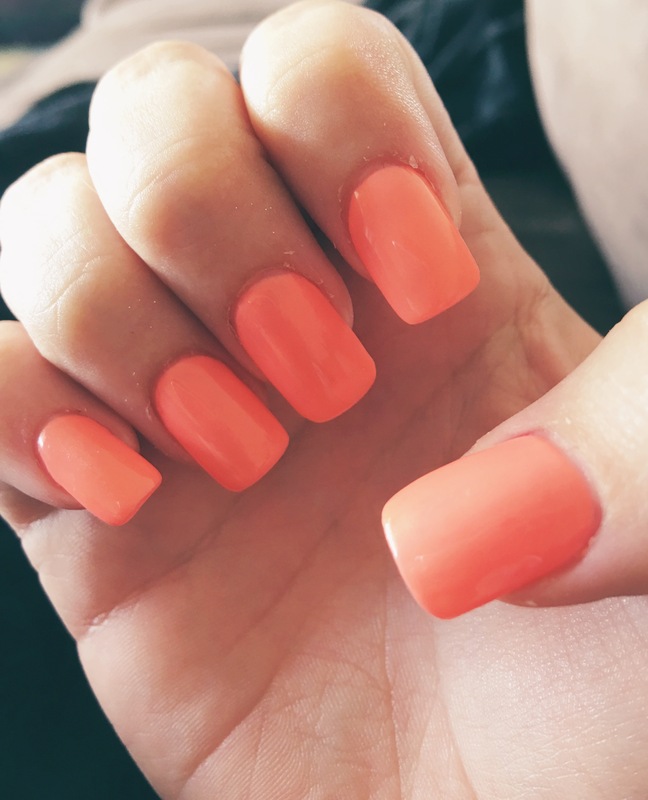 Anyway, after seeing the girl get it next to me last time, I decided to go with a orange-coral colour. When I first saw the girl getting it, I liked it but thought it wasn’t really my style. As the time approached where I knew I’d have to get my nails redone, I started seriously thinking about the colour (I like to go in there with some kind of idea of what I want or I’m there for half an hour trying to decide). I still wasn’t sure, but I decided I was going to try it. I knew it would look nice with the dress I was going to wear to the wedding, plus I wanted to try to do something a bit out of my comfort zone. I was used to having a normal colour topped with sparkles (which I still really like), but I’d done that for awhile and it was getting a little predictable. When the girl had finished up, I was really happy with the colour. Surprisingly happy. I thought I’d be okay with it, but I wasn’t sure I’d love it, and I really do! Plus, the girl sitting next to me saw the colour on my nails and changed her mind and decided she was getting the same colour instead of black which she’d originally requested. 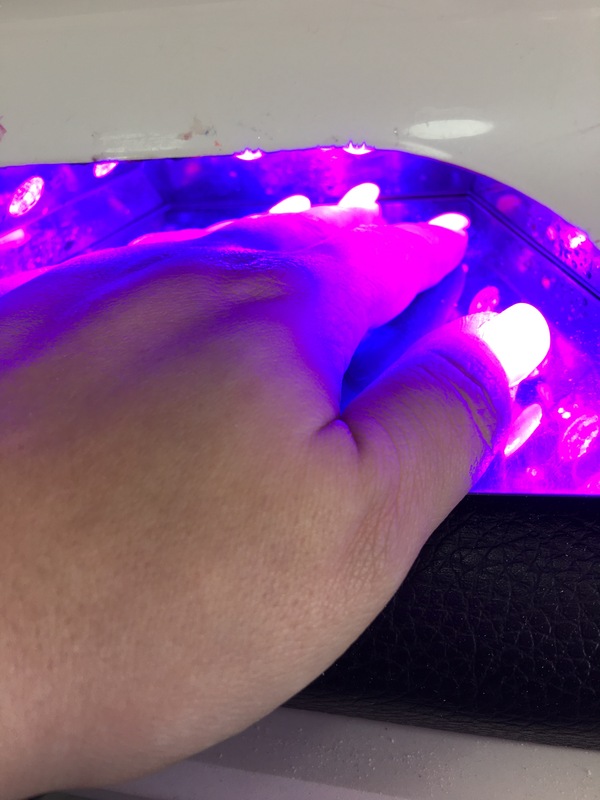 My favourite part about the polish is what it looks like while in the UV machine though. I wish they made nail polish that glowed like this all the time! Apart from my trip to the nail salon, everything else has been fairly boring today. I found some awesome new blogs, then fell asleep on the couch. Tonight, I’m planning on doing some cleaning in preparation for the bi-yearly house inspection that’s happening on Thursday. I’m having Lite n Easy Chicken Parma for dinner. We’ll see how that goes. My friend thinks it’s nice and the previous two meals I’ve had were really good, so hopefully this is too! I’ve eaten pretty well today if you ignore the fact I didn’t eat breakfast. I had saltanas and Savoy crackers with peanut butter for lunch. My calorie count should be well and truely under today, which will make up a bit for yesterday’s cheat meal. Oh, also worth mentioning, I jumped on the scale this morning (something I haven’t done all that frequently lately) and I’m almost back to the weight I was before I fell off the wagon. Looks like my fortnight of not caring didn’t hinder my efforts too much, which is great. I really think now that I’m eating portion-controlled, healthy meals for dinner (the main meal I had problems with), I will start losing weight steadily and not just in dribs and drabs. I hope so, anyway. It’s hard to find motivation when the scale stays the same! Hope your day was just as relaxing as mine! Thanks 🙂 it’s definitely a struggle but I’m determined to do it. I look forward to reading about your journey! What’s your goal weight? And do u mind I ask how much you weigh now? I’m trying to lose like 50pounds. I’m not 100% of my goal weight, I’d love to be 60kgs but I just don’t know if that’s going to be possible because I haven’t been that weight for like 10 years. Even 70 would be fine. I started at 93kgs, I’m roughly 90 now. Trying to get into the 80s! Very close! I’m 190pounds now but after I had my daughter two years ago it’s been so hard I’ve lost 10pounds so far and I’ve been able to tone alittle but I wanna be able to fit in my old weight which was 160-150pounds it’s been a struggle but I run a lot and do yoga and that helps me lose weight and of course eating healthier. I have been stuck at 147 for months now! I lost 13 pounds quickly and then it just stopped. I have been thinking of trying yoga (for old geezers). That is a beautiful color! I would love it in my bedroom. Yeah, it’d look nice as a wall colour!